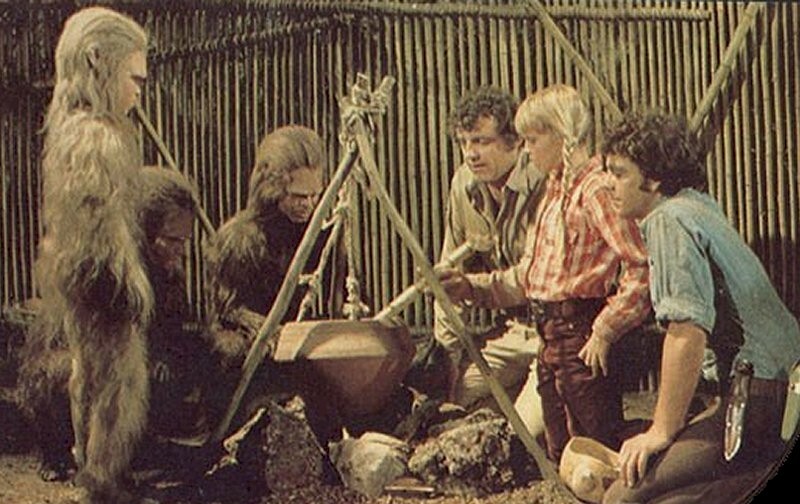 I’ll admit it, I wake up early on Saturdays to watch Land of the Lost on MeTV at 7:30 am. Sure, you can see the episodes on YouTube (Seasons 1, 2, and 3) or buy the DVDs, but I prefer the old-fashioned experience of watching it on a TV and knowing that other Land of the Lost geeks are watching at the same time. I am not going to address the 2009 Land of the Lost movie; I never saw it because I had already seen Will Ferrell in Bewitched and that was painful enough. I’m also not going to get into the 1991-92 series. No, this post is about the original 1974-76 series, with its delightful low-budget special effects and memorable theme song. It’s a great theme song, but I’ve got a few nitpicks. “Marshall, Will, and Holly…” Why is the father referred to by his last name and the kids by their first names? Even as a kid this bugged me. If a two-syllable name was required to fit the song, why didn’t they just name the character David or Steven or Henry? “On a routine expedition…” A rafting trip on the Colorado River is a “routine expedition” for these folks? For me, a routine expedition is a trip to the supermarket. Well, okay, Rick Marshall is a park ranger, so I’ll give them that. “And plunged them down a thousand feet below…” How much of a drop is that? Well, to put it in perspective the Empire State Building is 1,250 feet tall. A fall like that would kill you, but I doubt it’s enough to get to a subterranean dinosaur world. Ah, but you see, the Marshalls also fell through a time/space doorway—a key detail that the opening theme fails to mention. The Land of the Lost is completely outside our own world, as evidenced by the fact that it has three moons. Widower Rick Marshall, the father, is played by Spencer Milligan. With his curly mop of 70s hair, which matches the curly chest hair that peeks out over the top of his shirt, Rick is rugged and outdoorsy. Though protective of his children, he’s relatively calm and collected about the dinosaurs and various other safety hazards in the Land of the Lost. “Don’t wander too far off, now,” he’ll say to Will and Holly, as if he’s telling them to be careful with the car. Maybe his late wife was the anxious parent. Someone left his clothes in the dryer too long. Somewhere between Season 1 and Season 2, either Milligan gained weight or the wardrobe people shrank his clothes, because suddenly his shirt has noticeable gaps between the buttons. And his pants – well, when you have crotch wrinkles like those, either your pants are too small or you need to calm down. Milligan left the show after Season 2, and I’ll bet the real reason is that they wouldn’t give him clothes that fit. But Milligan has stated in an interview that the dispute had to do with merchandising royalties for his likeness on lunch boxes and things. Spencer Milligan wanted his fair share of royalties for the use of his likeness. 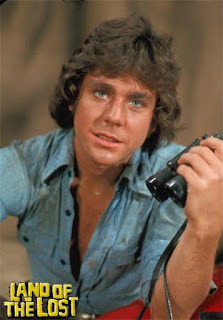 Speaking of cuties, Rick Marshall’s teenage son Will is played by 23- year-old heartthrob Wesley Eure, who is billed simply as Wesley. You might get away with one-name billing if you are Cher or Charo, but for almost anyone else, it comes off a bit pretentious. In an interview, a sheepish Eure explains that his manager suggested it. Did you know that Eure was cast to replace David Cassidy in The Partridge Family when Cassidy wanted to leave the show? He was going to be Keith Partridge’s best friend/next door neighbor. That probably would have worked out about as well as Uncle Jack replacing Rick Marshall on Land of the Lost. But we’ll get to that later. In 2009, Eure came out as gay in an interview in AfterElton.com. Among the tidbits revealed is that the gold chain worn by Will Marshall actually belonged to Eure’s partner at the time. It sure seems like Sid & Marty Krofft liked creating shows about lost boys: Jimmy in H.R. Pufnstuf, Mark in Lidsville, and Will in Land of the Lost. In fact, in the original concept for the series, Will didn’t have a sister, but then Holly was added. And thank goodness for that, or else the only recurring female character would be Sa the Paku. Holly, played by Kathy Coleman, is a tomboy–which is for the best, because can you imagine a girly girl managing in the Land of the Lost? One of my favorite episodes was a Holly-centered Season 1 episode, “Elsewhen,” in which a blonde woman calling herself Rani appears to Holly. She seems to know an awful lot about Holly’s family and offers her advice and insight. It doesn’t occur to Holly until the end of the episode that “Rani” is her own secret name for herself. (Is it just me, or is it a little strange to give yourself a secret name? I think I’ll call myself Antonio.) Rani is in fact grown-up Holly, who now wears a gown instead of a plaid shirt and jeans. Rani came through a time doorway to support her younger self. When her identity is revealed, Holly asks if this means they’ll one day find their way home. Rani says it means they can. But she won’t tell how. “You’ll have to find the doorway and the answer to it by yourself.” Yeah, you’re a big help, Rani. That’s as bad as Glinda holding out on Dorothy about the ruby slippers. Now that the actress who played Holly has grown up, we can see if the casting people got it right. On the left is “Rani” and on the right is Kathy Coleman as an adult. Why, it’s like they were separated at birth! So the Marshalls are stranded in this strange place, which, it turns out, is populated by monkey-people called Pakuni, various dinosaurs, and tall, scary lizard people called Sleestak. The Pakuni and the Marshalls make soup together. The Pakuni are named Ta, Sa, and Cha-Ka. I always thought Ta and Sa were Cha-Ka’s parents, but they are actually just elder Pakuni who boss little Cha-Ka around. 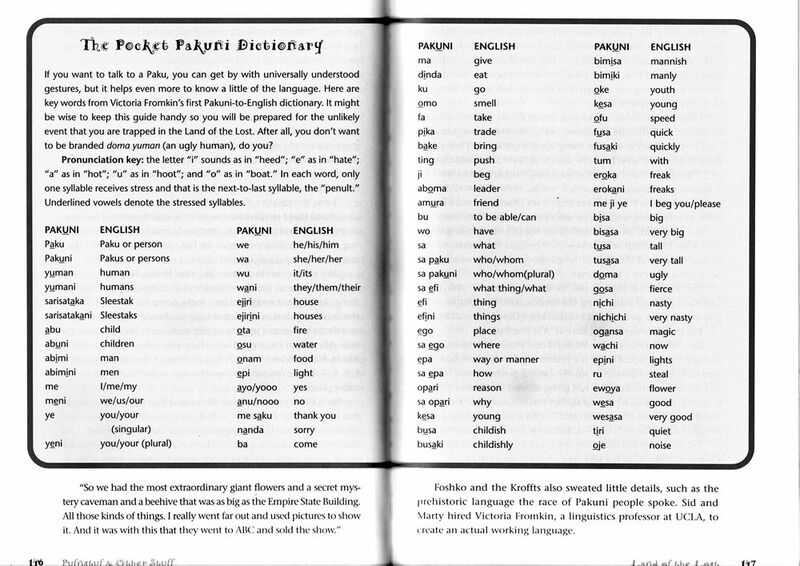 The Pakuni have their own language, and it’s not just random babble—it was actually developed by a linguist at UCLA, making it the first artificial language ever created for a TV show. They really should offer Pakuni classes in high school if they’re going to teach dead languages like Latin. But since they don’t, here’s a Pakuni to English dictionary. Guess who’s coming to dinner! It’s Grumpy. Then there are the dinosaurs. Holly has a soft spot for the dinosaurs and gives them names. There are Grumpy, Alice, Spot, Dopey, Emily, Spike, Junior, and Torchy, and Lulu. 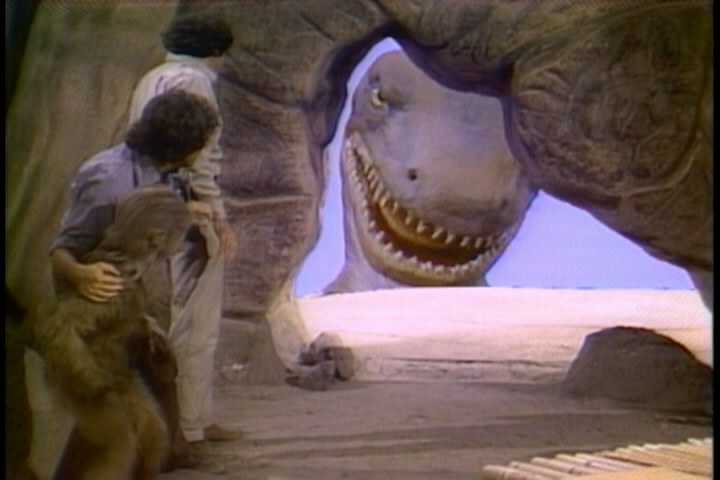 The cave where the Marshalls live, which they call High Bluff, offers some measure of dinosaur protection, but Grumpy sometimes sticks his head through the doorway and has to be driven away with a stick. 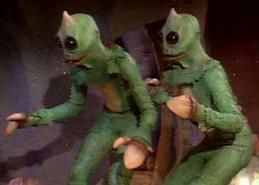 Sleestak are the Land of the Lost’s iconic lizard people, who are actually basketball players in wet suits. For real! Many episodes involve the Marshalls running around in the caves in the Lost City, pursued by green, stumbling, hissing Sleestak. There’s a lot more to be said about Sleestak, but I’m starting to get lazy, so just go to Wikipedia for more information. Beware of Sleestak. And don’t challenge them to a basketball game. Then there is Enik, who looks like a shorter, different-colored Sleestak wearing a vest. But looks can be deceiving. For one thing, Enik can speak. We meet him in the Season 1 episode “The Stranger,” where we find out that he, too, is temporally displaced. He is an Altrusian, he explains, a race descended from the Sleestak. He futzes with crystals and time doorways a lot, trying to get back to where he belongs. Enik has a Planet of the Apes moment when he realizes that the primitive Sleestak are not his ancestors, as he assumed—they are his descendants. “You maniacs!” he cries, pounding the ground. “You blew it up! Oh, damn you! Damn you all to hell!” No, actually he is much less emotional and more matter-of-fact than Charlton Heston. That’s the Altrusian way. See Enik’s revelation below at the 28:00 mark. Enik is mostly a friend to the Marshalls, except when he’s not. Apparently he isn’t very nice in some of the Season 3 episodes but I haven’t seen many of those. I’ll be watching them when they come around in the MeTV rotation to see if they’re as bad as everyone says. As I’ve mentioned, Spencer Milligan left the show after the second season. The show addresses this by opening Season 3 with Rick Marshall getting sucked through a time doorway (spinning around like a propeller). It happens so quickly that Rick doesn’t have a chance to look back, so we can’t tell that it is another actor wearing a wig. This sequence is used in the revised opening credits. Meanwhile, Rick’s brother, Uncle Jack, experiences the same phenomenon that landed the other Marshalls in the Land of the Lost, and he joins Rick and Holly there. By most accounts, this reconstituted trio of characters just never gels the way the original cast did. 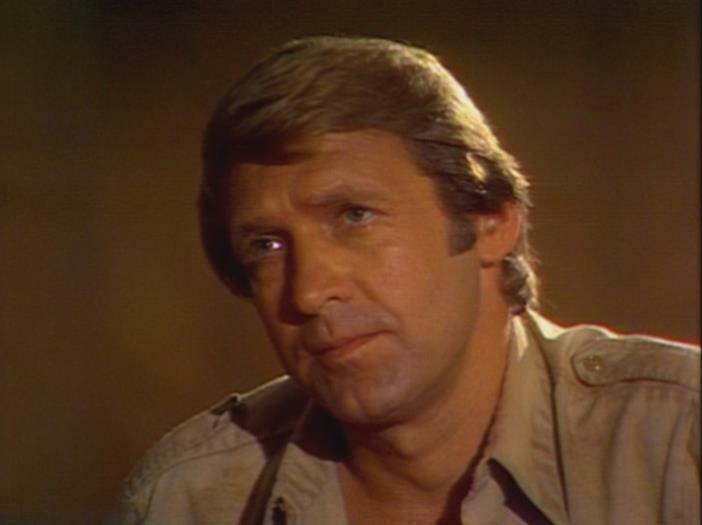 Season 3 sees other changes as well, including the destruction of High Bluff in an earthquake, leading to the Marshall’s moving their quarters to the Temple near the Lost City. (Closer to all the urban conveniences, I guess.) Wesley now has a last name in the credits. And Cha-Ka speaks broken English instead of his native Pakuni, which they had gone to such lengths to develop. I’m lost – I’m lost – find me!! Much as I object to Will singing in the Season 3 episodes, one of my favorite parts of the show is the closing theme he sings in Seasons 1 and 2. The first-person lyrics poignantly capture the young man’s angst as he struggles to find his way through adolescence in this strange land far from home. We always see the Marshalls as a family, but this window into Will’s thoughts makes us realize he is also an individual who must feel deeply lonely and isolated, despite the company of his father and sister. In closing, I’d like to say that if any of the actors stumble upon this post, I apologize for the snarky things I said. Please understand it’s all in good fun. Also, stop Googling yourself. Next Today on the tray: Ginger-bread or Mary Ann-bread? Fun post on a great, classic show. I rewatched it a few years ago with my kids and I was impressed with the quality of writing and continuity in seasons 1 and 2. Season 3 was such a depressing drop-off from what was built before. I think I will start DVRing the MeTV airings to watch once again. Count me in as one of your fellow geeks who get up early to watch it on MeTV too! This series continues to thrill me–and those Slestacks will forever haunt my nightmares. Great review–thanks for writing this. Thanks, Joanna! I was thinking of you this morning while I was watching today’s episode, wondering if you were watching it too. Michael, I didn’t know much about LAND OF THE LOST, so this post was informative and fun. One of the most interesting facts was the STAR TREK connection. I love the photos of the “future Holly” in the series and what the actress actually looked like years later. Also, that is an awesome lunch box. Did you have one? I didn’t have the LotL lunchbox — my lunchbox was Chuck Connors in “Cowboy in Africa,” a show I have never even seen once. Hilarious post! I especially loved your deconstruction of the theme song and your description of Rick’s shrinking wardrobe. Thanks, Amanda. I had a crush on Will too. I’m envious of your husband for having met him. Be warned: I think Season 3 starts next week in the MeTV schedule. Were you aware that Kathy Coleman has a book coming out April 2015? It sounds as though her life after Land of the Lost was as harrowing as the trip down the waterfall and several attacks from Grumpy.